S.R. Smith Helix2 Pool Slide, Solid Gray | Fountain City Art Ctr. 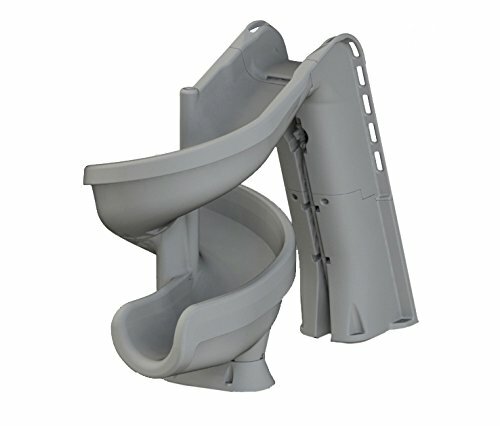 The heliX2 spiral slide is an amazing in ground pool accessory that is 88" tall with the widest flume in its class. A guaranteed Instant attraction, this Super slide features a 360 Degree turn & an integrated decorative fountain. It's fully roto-molded HDPE construction is salt-friendly & provides strength & durability so you can be sure it will last. Features an enclosed ladder & molded handrails to ensure maximum safety when climbing. The heliX2 is designed with simple, oversized components for quick & easy assembly. The heliX2 is fully CPSC compliant & accommodates sliders to 250 lb. Required deck space: 5 x 9'. All-in-one 360 Degree Adventure ride with deep flume, sturdy molded in handrails and enclosed ladder. If you have any questions about this product by S.R. Smith, contact us by completing and submitting the form below. If you are looking for a specif part number, please include it with your message.